One of my friends asked which recipe was my “go-to” side dish when entertaining. She wanted something quick, easy, but that was going to impress her guests. No problem! 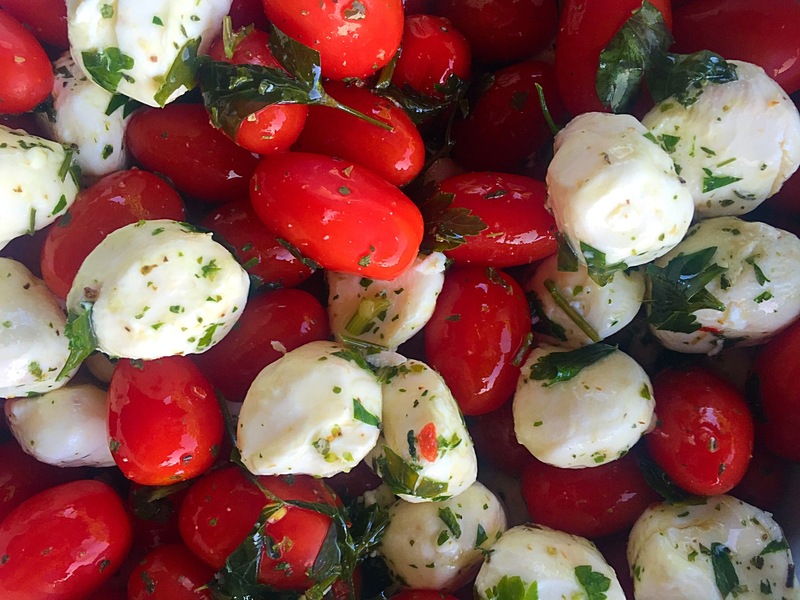 This caprese salad has always been a hit. Plus, there’s quick shortcut to this dish that I LOVE LOVE LOVE. 1 container of grape or cherry tomatoes. Both work great! 1 container of mozzarella bocconcini drained. Just look by the mozzarella in your cheese department for the small balls of mozzarella. They are about 1/2 inch -1 inch round. Okay ready for the easiest version ever? Most places will sell the mozzarella bocconcini already marinated in olive oil with all of these yummy spices. So grab yourself a large bowl. Empty the container of mozzarella and oil into the bowl, add tomatoes, toss gently, and serve. You’re done.